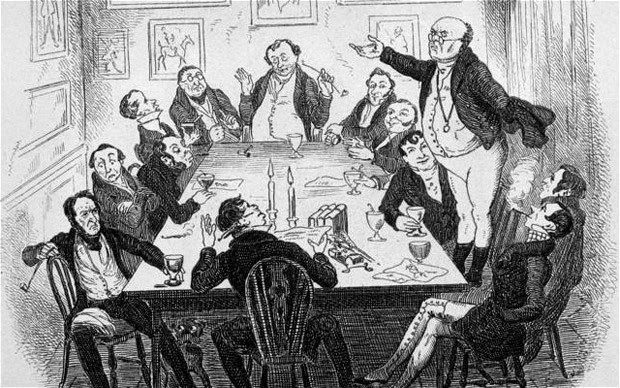 It's time to break out the Dickens again for another Dickens in December readalong, hosted by the wonderful Bex of An Armchair By The Sea. I totally meant to do an intro post but um, I didn't, so let's just say here that before I started reading it I knew next to nothing about the book. In general I'm not really a massive Dickens fan (I like the stories, not too sure about the writing style), but last year I also joined in with the readalong of A Tale of Two Cities, which overall I would say that I enjoyed, but I did still struggle with somewhat. This meant that I was slightly nervous going into The Pickwick Papers in case it all became too Dickensy for me. But to my surprise, I actually enjoyed the first section a lot! Another good thing about it is that it's pretty fast paced, so if you aren't particularly interested in what's going on then it's very likely that the next chapter is going to be about something completely different. It feels like it has been a long time since I have read a book that focuses more on small events happening throughout the book than on an overarching plot. It actually feels weirdly nostalgic to read, as a lot of the books (particularly classics) that I read when I was younger were more along those lines - Little Women, A Little Princess, What Katy Did At School, What Katy Did Next (weirdly I can remember these two much more vividly than the first book), a lot of Astrid Lindgren books (I will always love you, Bullerby children). I seem to have fallen out of the habit of reading these, but honestly this whole thing is reminding me that I should probably have some books like that mixed into my reading. As far as the characters go I definitely love Pickwick and Tupman already, although I feel like the other members of the Pickwick club have not really had a chance to shine yet. Hopefully they will in the rest of the book. I also enjoyed Mr Jingle, and I sort of hope that he keeps on popping up throughout the novel to stir things up. The one thing that I don't quite get though is why there are so many anecdotes included in it, that are either told by other people or written down and read by one of the characters... like, I don't really get why they're there at all? The ones so far have not really been that interesting to me, and they have a decidedly different tone to the rest of the novel, it just seems a bit odd to have them there. I guess though, it is Dickens, so he has to do some moralizing at some point, and they are there to fill his moralizing quota? Perhaps. Anyway, I am definitely enjoying it, and I think that one of my main issues with this readalong might be actually making myself stick to the schedule! Yay for enjoyable, very readable Dickens! Let's hope that the book carries on in this vein. Now general benevolence was one of the leading features of the Pickwickian theory, and no one was more remarkable for the zealous manner in which he observed so noble a principle than Mr. Tracy Tupman. The number of instances, recorded on the Transactions of the Society, in which that excellent man referred objects of charity to the houses of other members for left-off garments or pecuniary relief is almost incredible. - I wish that I had used this at some point to respond to somebody asking me out. "Who could continue to exist, where there are no cows but the cows on the chimney-pots"
I quite like Mr... Winkle? as well. The one who keeps saying he can do things when he very clearly can't. I have one of the free e-books (the gutenberg version) and haven't had a problem with it at all! It is possible! Or he was just doing the typical Dickens thing of trying to increase the word count, hehe. The one who was going sideways on his horse, right? Hehe, yeah he's likeable too! I hope that there are sections that focus more on him and Snodgrass, because all I can remember about Snodgrass so far is that he's a poet. Maybe I should have got that free one then! Although I only paid like a pound for the one that I got, so I'm not feeling too bad about paying for it. I think I might actually prefer reading it on an e-reader as you avoid the problem of minuscule text that I've had with printed classics before, plus I can highlight things easily (I can't bring myself to write in actual books). I still want a pretty copy for my shelves though. If I'm going to struggle through Dickens then at least people who see my bookshelves should know about it, dammit! Hehe. I know the random stories were very Dickensian, but I don't really like Dickens that much (I'm obviously a masochist as this is my second Dickens readalong, hehe), so yeah. They don't do anything for me. Aww I am seriously the only person who liked the first chapter, aren't I? What's wrong with me? I'm glad I'm in this readalong with you - I'm also looking for a pretty printed version for my collection, so I'll let you know if I find anything. Currently reading the kindle version. Yeah! Finally some Dickens that I can actually sit down and enjoy reading! Do let me know! I'm going to keep on looking as well, but I don't really want to order anything online unless I know it's nice, and I've already been to the bookshops near me with decent English sections, hehe. BOO! I might have to search when I'm in the UK this Christmas.